It's kinda like how ZombiU didn't have off-TV play (Does it?). 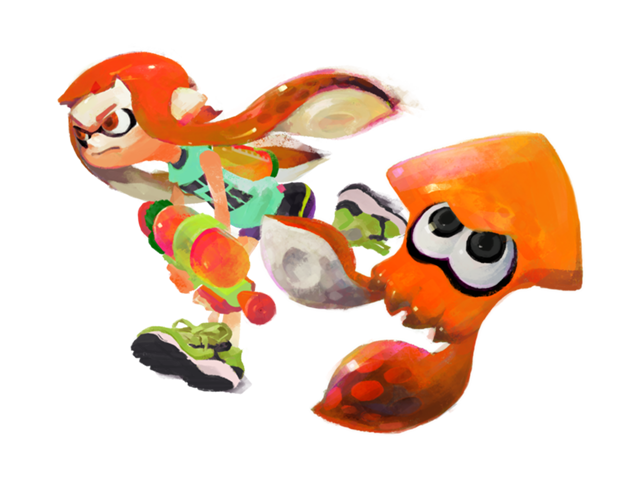 SETTLE IT IN SMASH SPLATOON. The whole off-TV play thing is an interesting situation. I'm of two minds on it. One hand, I can play these games while watching sports, or while my girlfriend watches reality TV (how cliche are we?). On the other hand, the games that actually have interesting uses for the gamepad can't have it. Good problem to have, I suppose. Never has a game more tempted me to buy a Wii-U. Can't afford it right now, but if I get my employment situation sorted, I might have to invest in one. Redwing, be on the lookout for refurbished and used deals that will be dramatically cheaper and come bundled. Good luck on your employment situation, and kudos for being responsible! If they have lay-by still, TargetAU has a pretty sweet deal with a Splatoon Bundle, and the choice of 2 of 5 games. Of course, you're gambling on the layby period being greater than the employment window, so take care (and best of luck on the job front too). It's unlocked! Here's hoping the servers work. They're up and butter smooth. I'm kinda waist-deep in the Witcher 3 right now, but I'm very tempted to go out and buy this when Best Buy opens. Still kinda torn on physical vs. digital, but at the end of the day I could get it for $43 at BB vs. $60 digitally. - saying that you have to use the phone to call a friend to join their lobby is ridiculous. Ever heard of IM/twitter? And if you can't join them because they're in a game or their lobby is full, you get put in a queue, so there's no need to join them at the exact same time. About the only thing I agree with is the inability to change loadouts between matches without exiting the lobby, that would be a handy feature. Missed the amiibo 3 pack by less than 3 minutes. Target had +1 to the initial rush, and they put that one out after and the guy said there was one left and walked over and was surprised it was already gone. I decided to skip the individual guys as the squid form was what I really wanted. I got my squid in an individual pack, which you can do if you import it from Japan... how deep does your obsession go? If it will cost more than $2 more than a single, not that deep, which I assume it would. EDIT: And one more note to add. Splatoon has the lofty honor of being my first $60 out of pocket video game purchase. I am that excited to play it. Those two features are something I think any game like this should have. I am always wanting to be able to check out the maps on my own in online MP games, and most of the time you can't. Or, if the game has dedicated servers, you can go to an empty server, but risk random people seeing someone there and joining in. I played for a couple hours after launch last night and made it up to level 4. True to what I said a few weeks back, I didn't even look at the single-player campaign or even take a whole lot of time to look around Inkopolis. I saw the button to join a lobby and jumped right in. The online play was really quick and smooth. I didn't have to wait long to find players, and performance once I was in a game was nice, even when I was in matches filled mostly with Japanese players. 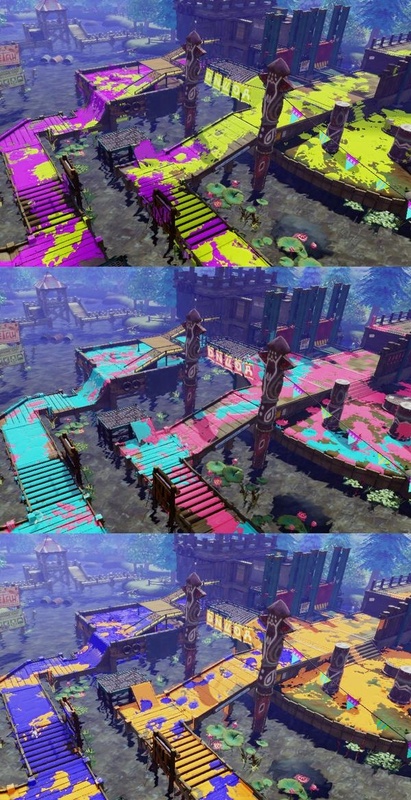 It was fun watching some of the other players, because I'd say about half of them forgot that the game isn't about splatting your opponents but about covering territory in ink. There'd be this big rush out of the gate to get to enemy territory quickly, but they'd leave most of our territory bare and ripe for a clever enemy players to sneak in and ink up. The teams with the most kills, and the teams with the highest-level players, didn't always win. Gear seems interesting. Each piece of gear you buy has some kind of upgrade attached to it plus one additional upgrade that is randomly determined after you've played a few matches with the gear equipped. The upgrades I've seen so far have been minor: enough to help, but not enough to let you dominate or to make up for poor play. Which makes me less concerned about balance than I could have been. It remains to be seen if those gear upgrades can stack or if there are better upgrades down the line, but right now they're balanced so that you get a small advantage in an area or two without getting a huge one. We'll just have to see how that holds up over time. The weapon upgrades don't seem like upgrades so much as different pre-configured gear sets. You can't pick and choose your own secondary and super weapons, so each set of gear is balanced around trade-offs between the three weapons at your disposal. Again, we'll have to see how that holds up over time, as well, but I'm pleased with what I've seen so far both in my equipment and in what others are sporting. Looking forward to playing more! There are more near me - want me to get you one, garion? Nah, I'm going out to check after work. I'd still be interested in what you have if he doesn't go for it. I'm playing right now! Trying to join Blind_Evil and his lobby! Another 6 hours before I get mine. I could digitally grab it right now, but I'm settling on physical, for less money down. I figured it would be something 'nice to hold' and I have an excuse to go out early and pick up this, and the three pack Amiibo, with my 7 year old daughter at 8 am when the stores open. Yay! that sounds like fun. 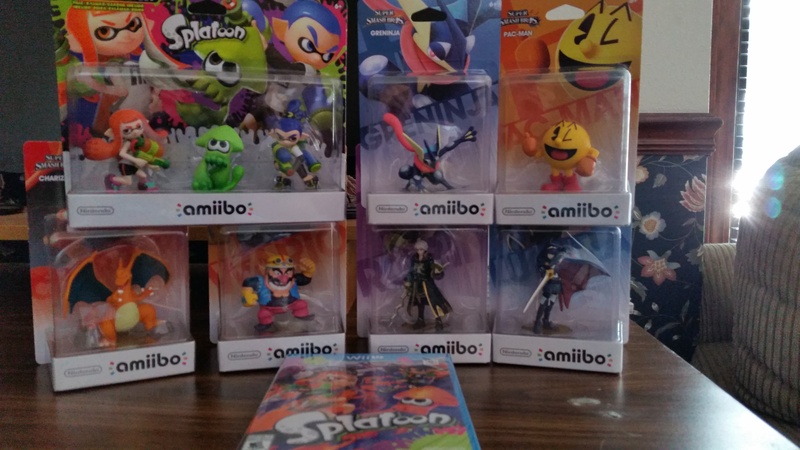 Cross posting my pic from the Amiibo thread but I'm ready to do some Splatooning this weekend.